About "Area of Triangles and Quadrilaterals Worksheet"
Worksheet given in this section is much useful to the students who would like to practice problems on area of triangles and quadrilaterals. Find the area of the figure ABCD shown below. Use AB as the base. Then, b = 16 and h = 9. Use AD as the base. Then, b = 12 and h = 12. Notice that we get the same area with either base. 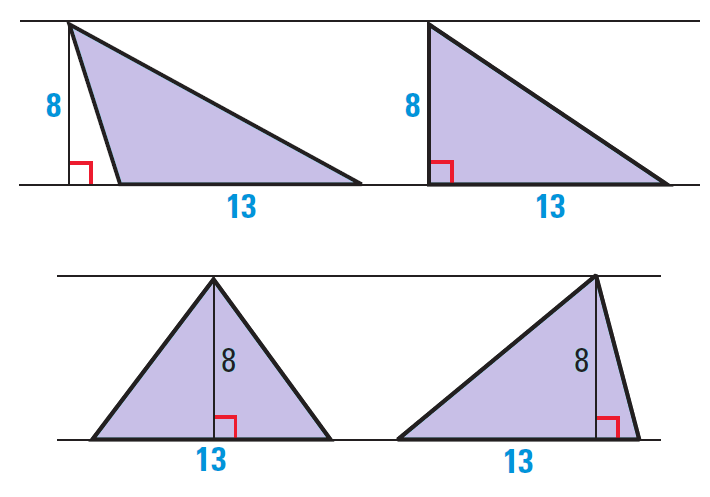 Find the height of a triangle that has an area of 12 square units and base length is 6 units. Because we want to find height of the triangle, we have to rewrite the area formula such that h is alone on one side of the equation. Given : A = 12 and b = 6. Hence, the height of the triangle is 4 units. 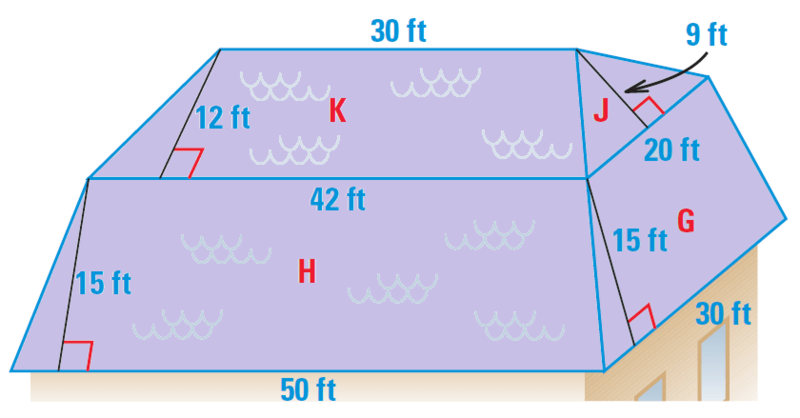 A triangle has an area of 52 square feet and a base of 13 feet. Are all triangles with these dimensions congruent. There area many triangles with these dimensions. Some are shown below. 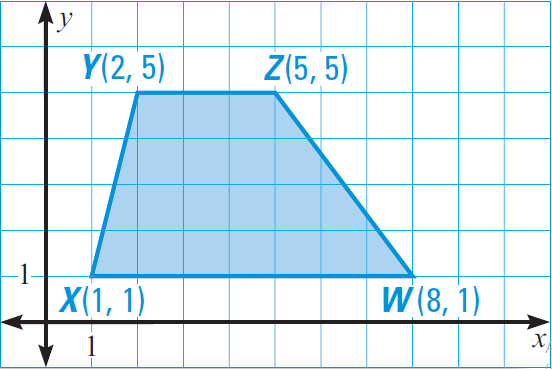 Find the area of trapezoid WXYZ shown below. Substitute h = 4, b1 = 3 and b2 = 7. Hence, the area of trapezoid WXYZ is 20 square units. 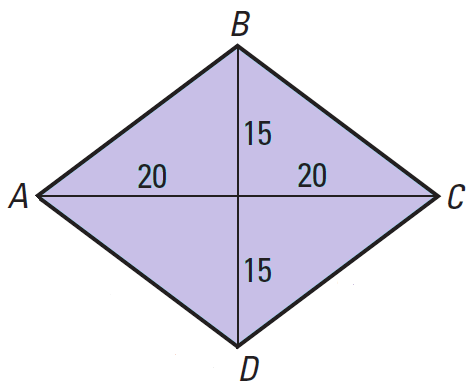 Find the area of the rhombus ABCD shown below. 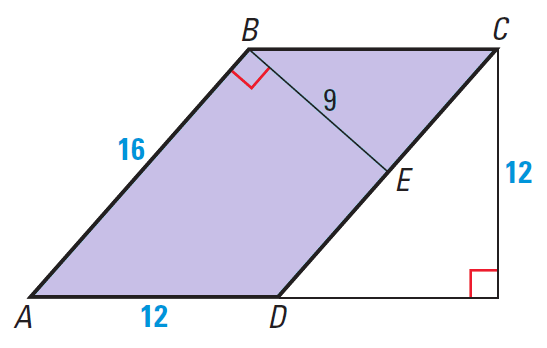 Let d1 and d2 represent lengths of the diagonals AC and BD respectively. Substitute d1 = 40 and d2 = 30. Hence, the area of rhombus ABCD is 600 square units. Find the area of roof of the house shown below. G, H and K are trapezoids and J is a triangle. The hidden back and left sides of the roof are the same as the front and right sides. The roof has two congruent faces of each type. Hence, the total area of the roof is 3174 square feet. After having gone through the stuff given above, we hope that the students would have understood, "Area of Triangles and Quadrilaterals Worksheet".